Each camera perspective can be used and warped in different ways to accomplish different goals. In genre terms, survival horror has the widest and most unique uses of camera perspectives. There are horror games in first-person, third-person, second-person, and even 2D that have used the camera creatively to stress, scare, and stimulate players. Once again we’ll start with the third-person camera as it’s one of the most versatile and common perspectives. The problem third-person cameras present to survival horror is that they allow players to quickly get clear, complete, and accurate understandings of their surroundings. This is great when you’re a dashing adventurer or a platform-bouncing rodent, but survival horror revolves around confusion, doubt, and self-inflicted mental mutilation. 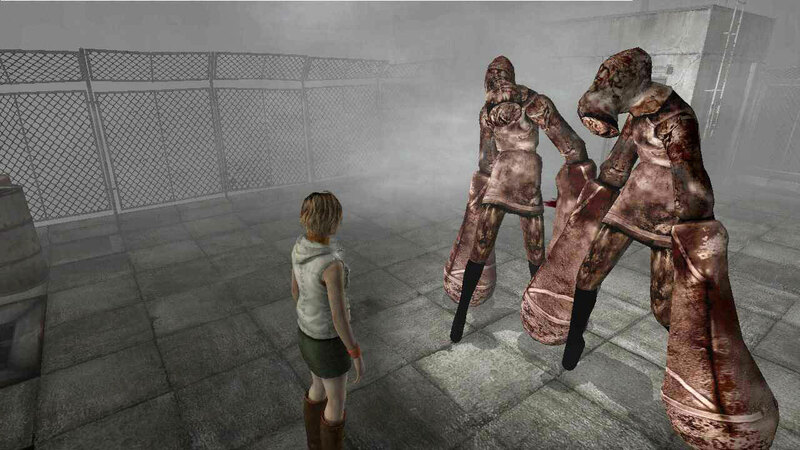 Silent Hill overcomes that obstacle by surrounding every area in a thick fog or darkness, limiting the player’s vision. When players are taught to not rely on their own eyes, they instead turn to their ears. 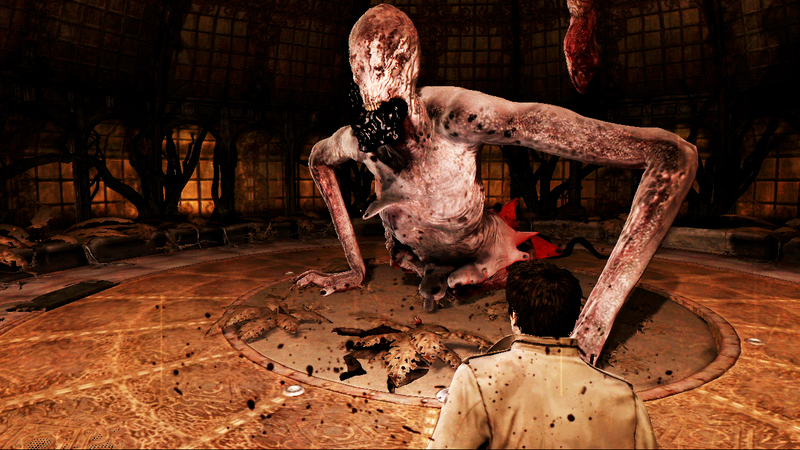 By adding segments in which players hallucinate, such as in Call of Cthulhu, designers can reduce the reliability of sight further. Combining terrifying sound design with a debilitating camera and unusual visual design allows designers to influence player emotions through audio. This focus on sounds and music lets the player create their own mental images by stirring the imagination. Imagination is the key to horror, and it can just as easily be used to scare as inspire. Alternatively, utilizing fixed third-person views could also provide an option to restrict player vision. Fixed cameras are staples of older survival horror games such as Resident Evil. The problem with fixed camera angles is that sometimes the restriction of vision will annoy and irritate the player just as much as stress them out. There’s a fine line to walk between tension and annoyance. These fixed perspectives give us a perfect jumping point into the use of second-person cameras. A fixed third-person perspective can even double as a second-person camera with a little bit of creativity. While walking through an abandoned back alley in the beginning of Silent Hill, the camera cuts away to a fixed third-person perspective — one that seemingly breathes and stalks the player as they walk. Last time I checked, most cameras don’t eye you as dinner. This never reveals itself to be anything more than a sinister trick, but still feeds player imaginations and adds an ominous air to what would otherwise be simply walking down an empty corridor. From second-person to first-person, most known for its use in survival horror from Amnesia: The Dark Descent. But instead I’d like to look at the upcoming indie game Among the Sleep. The title is still in development, but the driving ideas behind the game are genius and serve as perfect examples of how to do horror. In Among the Sleep, you play as a two year old who must navigate a house filled with all manner of boogeymen. Since vulnerability is a cornerstone of survival horror, it only makes sense to put the player in one of the most vulnerable roles possible: a toddler. Everyday areas such as living rooms and kitchens are now seen from a different angle, one barely tall enough to see over the tables. The first-person perspective already limits the player’s field of vision, but by twisting expectations of space due to the main character’s height, the designers add an element of the uncanny. Lastly, we have Lone Survivor, showing us how a side-scrolling 2D perspective can be used to discombobulate and disturb players. With a map, the 2D environments are easily navigated and manageable. This comes with one caveat: the game doesn’t pause when you open your map. This means it must be used in times of relative safety to plan out a route beforehand. You soon realize that you can’t check your map should you be chased by a beastie. Without the option to open your map, navigating the 2D environments suddenly becomes hectic, tense, stressful, and confusing. As we’ve seen, the basic principles of camera perspectives can be further altered to fit or enhance certain emotional engagements. By taking a basic understanding of camera perspectives and putting a bit more thought into how they fit with a game’s core design, even other genres can benefit. First-person shooter, or third? Classic platforming camera or fixed? It depends on the focus of your game design. Even if we already understand the rules of how something works, we can always benefit from simply taking a closer look.